Hi All! 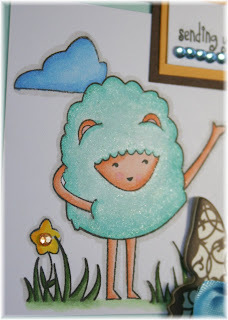 Today I have a fun card that showcases the super fun Shimmerz Blingz color in "Wintergreen". This color is so refreshing and sparkly! I really love it :) I first started by coloring in the My Favorite Things Hooga Booga image with my Copics. After I did that I applied two thin layers of Shimmerz Blingz in "Wintergreen" with a paintbrush. I took a close up shot so you could really see the shimmer. Well, that's all for today but make sure to check back for more awesome creations from my fellow DT members. This is really cute. I really need to get some of the Copics pens...they seem to color so wonderfully! I really love the way the Bingz adds to the card. Great work! Oh My GOodness! Such a sweet card!